The U.S. Army Corp of Engineers and Bureau of Reclamation announced that the flows released from Lucky Peak Reservoir will increase to around 7,000 cfs at Glenwood Bridge by Tuesday, March 7th. 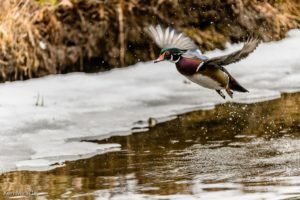 The increase in flows is expected to submerge large portions of the greenbelt and other low-lying areas but will help lessen flood risk later in the season, especially if rapid snow melt occurs. 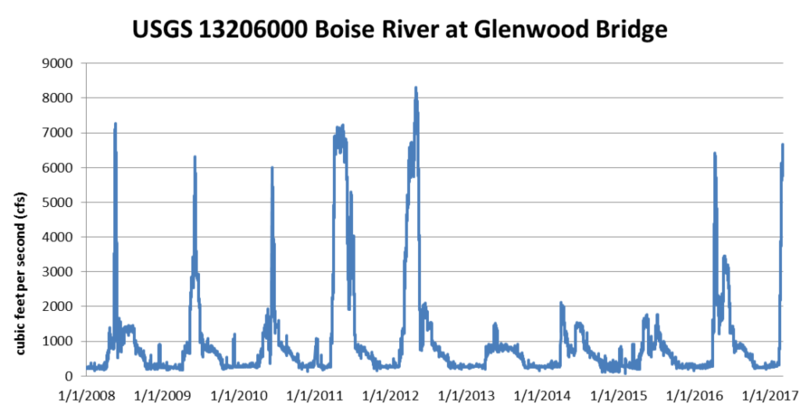 Over the past decade, flow releases exceeded 7,000 cfs at the Glenwood Bridge in 2008, 2011 and 2012, and exceeded 6,000 cfs in 2009, 2010 and 2016 (USGS 2017). However, it is unusual for regulated flows of this magnitude to be released this early in the year. Current channel capacity ranges between 3,500 cfs and 10,000 cfs depending on location and changing conditions. While minor flooding is expected to occur, high flows are beneficial to plants, wildlife and people along the Boise River. High flows inundate wetland and riparian areas within the floodplain that are not accessed during regular flows allowing for nutrient exchange; filtration, retention and removal of pollutants; groundwater recharge and discharge; food chain support; habitat for many species of birds and wildlife; and increased recreational and aesthetic opportunities. High flows also deposit sediment and clear away open ground for new plants to propagate, particularly willow and black cottonwood that are keystone ecosystem species. High flows only become a problem when flooding of infrastructure occurs – a result of channel confinement and removal of floodplains by development, agriculture, transportation infrastructure and flood control measures. Healthy, connected floodplains give the River more room as it rises and slow down flood velocities, thereby reducing flood risk. 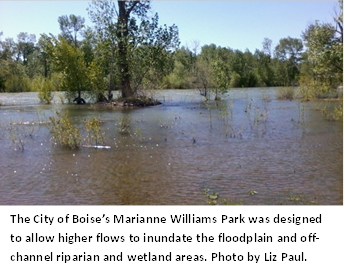 Therefore, the Boise River Enhancement Plan identifies protection of existing floodplains as a top priority. Excavating side channels and off-channel areas, such as wetlands. Protecting and enhancing floodplains allows the river the capacity to safely pass higher flows that benefit us all. A dozen hard working volunteers pitched in on February 22 to install coconut fiber erosion control mat over topsoil at a new habitat enhancement project on the Boise River by Eckert Bridge. The $45,000 aquatic habitat enhancement project was finished late last year, but there hadn’t been time to replant vegetation and stabilize the soil before water levels began rising in the Boise River. 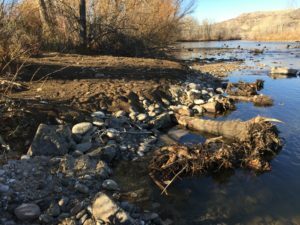 When it was announced on Feb. 21 that water levels would rise above 5,000 cfs, project sponsor, the Ada County Environmental Advisory Board, sprang into action working with Idaho Department of Fish and Game to procure needed supplies and round up volunteers. The disturbed ground at the two engineered log structures on the north side of the river was covered with the erosion control mat and anchored in with willow cuttings and wood stakes. The site on the south side was already fully submerged. ENEL Green Power pitched in providing volunteers and helping purchase supplies. BREN provided volunteers and snacks. Thanks everyone. The Boise River will have better habitat for fish and wildlife and cleaner water and more community members, including refugees, will participate in stewardship activities if funding is awarded to two BREN-facilitated collaborative enhancement projects. BREN partnered with the Ted Trueblood Chapter of Trout Unlimited, City of Boise, Idaho Department of Fish and Game, Boise Valley Fly Fishers, Ada County Highway District, Intermountain Bird Observatory, and Land Trust of the Treasure Valley to apply for Phase II funding from the U.S. Bureau of Reclamation Cooperative Watershed Management Program for the Cottonwood Creek Daylighting Project. The creek now flows through a buried flume underneath Julia Davis Park before discharging to the river. The Boise River Enhancement Plan identifies channel confinement and simplification as the #1 issue impairing geomorphology and fisheries habitat in the Boise River and recommends daylighting tributaries to improve habitat complexity. This exciting project would create an open stream channel through the park and improve the confluence with the river to allow for fish passage. The daylighted creek will support salmonid spawning and rearing habitat and create new wetland and riparian habitat that supports wildlife and improves water quality. The project includes a robust engagement, education and outreach component with many opportunities for volunteers to participate. Knowledge transfer and inspiration will support similar collaborative efforts throughout the watershed. Awards will be announced in May. BREN teamed up with many partners to apply for funding from the National Fish and Wildlife Federation for the Hyatt Hidden Lakes Multicultural Habitat Project. The project will engage refugees from many nations and traditional conservation stewards in transforming weed-dominated uplands at the City of Boise’s Hyatt Hidden Lakes Reserve into healthy habitat for passerine birds and non-game animals. 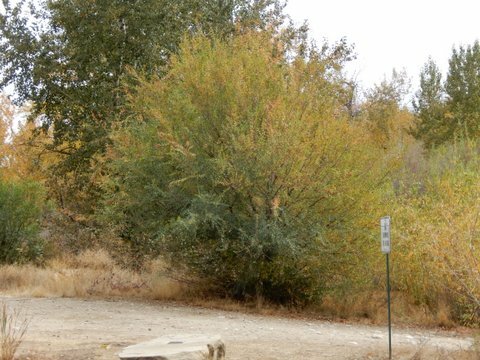 The Boise River Enhancement Plan identifies invasive plants as a primary issue affecting habitat function and value, and the removal of invasive plants and planting of native vegetation is a top recommendation. Under the leadership of BREN and the Land Trust of the Treasure Valley, the collaborative project will engage existing and new volunteers, including refugees who live nearby, to remove weeds and plant native trees, shrubs and grasses on 12 acres. Volunteers will collect local seeds and grow some of the plants for the project, greatly increasing plant survival. Partners will provide on-and-off site educational programs and host field trips and work days. BREN will share stories and photos of the project to increase support for Boise River enhancement. Partners are City of Boise, Land Trust of the Treasure Valley, Golden Eagle Audubon Society, Idaho Weed Awareness Campaign, Partners for Clean Water, The Wetlands Group, Boise State University, Idaho Office of Refugees, Idaho Department of Fish and Game, and Big Brothers Big Sisters. Awards will be announced in July. 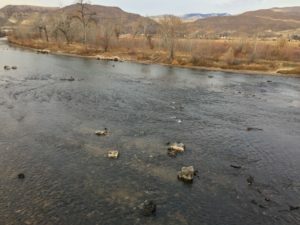 In 2011, lower Boise River stakeholders agreed that increased cooperation, communication and networking was needed to advance ecological enhancement of the river. 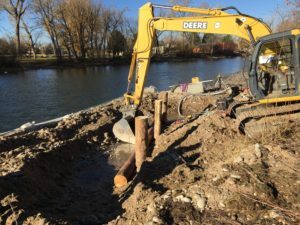 The Boise River Enhancement Network was founded to provide those essential connecting services; to serve stakeholders as a “backbone” organization whose staff or volunteers plan, manage, and support enhancement work. BREN facilitated development of the Boise River Enhancement Plan in 2014/2015, maintains a website, Facebook page and email list to support communication, hosts numerous educational events each year, engages members and volunteers in reviewing, designing and implementing enhancement projects and assembles collaborative teams to pursue funding for projects like these that align with the Enhancement Plan. Please let us know how BREN can support your enhancement project. 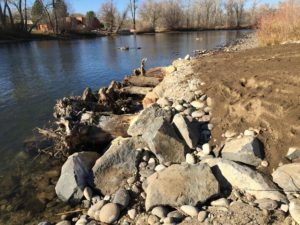 The Ada County Environmental Advisory Board’s aquatic habitat enhancement project in the Boise River near Barber Park and the Eckert Bridge was completed in early December. Boise River Enhancement Network members were a driving force to advance this first-of-its-kind project. 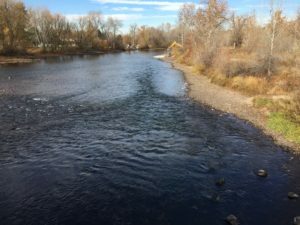 The project addresses the lack of instream cover, habitat complexity and low-velocity resting areas identified in BREN’s Boise River Enhancement Plan. 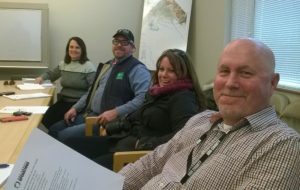 This outstanding collaborative project was led by Scott Koberg, Ada County Parks and Waterways Director and Joe Kozfkay, Regional Fisheries Manager Idaho Fish and Game with support from the Board, Harris Ranch, City of Boise, and others. 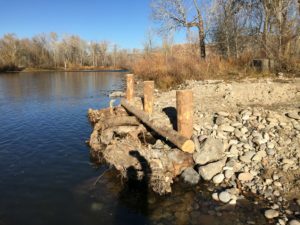 The $45,000 project included two strategies designed by Idaho Fish and Game to improve aquatic habitat by increasing channel complexity as well as providing more cover and current breaks; engineered log structures and boulders. The log structures, two on the north bank and one on the south, are partially buried in the riverbanks and anchored to the river bottom with log pilings. The boulders were carefully placed to improve channel dynamics. Three vertical logs were pounded into the river bed to anchor the structure. 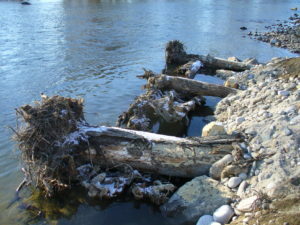 Logs with root wads were buried into the bank and bolted and cabled to the anchors. A pool was excavated for the root wads. Smaller log were built into the structure and cabled in place. The anchors were trimmed to ground level, protective rocks were placed and planting mix was placed on top. Native plants will be planted in the early spring. South bank – Good view of the large coffer dam installed to protect water quality during construction. Logs were sourced from the Broadway Bridge project and other local projects. The excavated pool provides more habitat around the wood. Rocks are placed upstream to divert flow that could stress the structure and fill in the pool. During higher flows the structures will be under water. The structures are very dense with wood. Boulders were donated and placed up and downstream of Eckert Bridge. The boulders were placed singly and in clusters. They provide resting places, cover and current breaks. The Idaho Department of Fish and Game generously provided permitting, engineering and project management services necessary to implement this project. The project was funded by Ada County and EGP-NA, who operates Barber Dam and is a co-licensee with Ada County on the FERC license to generate power at the dam. Thanks to Scott Koberg, Kate McGwire and Liz Paul for providing these photos. 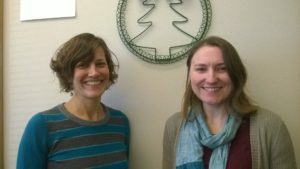 I am writing on behalf of the Boise River Enhancement Network (BREN.) BREN is a local network of over 200 members whose primary goal is to promote the ecological enhancement of the Boise River. BREN appreciates the opportunity to comment on the draft Ann Morrison Park Master Plan. We support the overall vision presented by the City of Boise to improve the park layout to make it more user-friendly and provide exciting new amenities. Improved water quality through a new stormwater management system. Protect riparian habitat along the river corridor. The river currently supports a large canopy of black cottonwoods along stretches of Ann Morrison Park. We support current plans to enhance this critical habitat. However, current plans will also result in the removal of riparian vegetation to make room for several beaches, a boardwalk, a boat launch, and river viewpoints. When possible, we recommend the City place these amenities in areas of existing access points to minimize removal of trees and encroachment of habitat. We also recommend the City consider scaling back on some of these amenities to avoid impacts to critical habitat. Actively manage recreation along the river. Current plans will attract more people to the River corridor. We recommend the City clearly mark formal access points and use passive controls (i.e. boulders, vegetation) or active controls (i.e. fencing) to direct users away from accessing the river corridor outside of approved access areas. The installment of beaches along the river and other modifications (such as the creation of a side channel) comes with risk of future channel instability. The City should invest in modeling and design services before any of these features are implemented. The City should also be prepared to invest in ongoing maintenance of the beach/beaches, if implemented, as erosion will likely be an issue. Again, we appreciate the opportunity to provide input to the draft Master Plan layout for Ann Morrison Park. If you travel on State Street or Capitol Blvd. or frequent Traders Joes, Boise Brewery or other businesses on Broad Street, it’s been a season of lane closures, traffic delays and annoying inconvenience. You can take heart in your suffering – the Boise River will benefit from new stormwater management practices installed as part of these road projects. 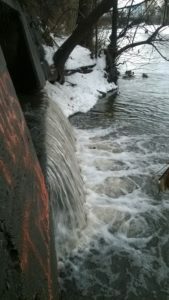 Stormwater is rain or snowmelt that flows off impervious surfaces like roads, parking lots, roofs and driveways and carries pollutants into the Boise River, including sediment, bacteria, nutrients, oil, grease, and heavy metals. The pollution can cause public health problems, promote growth of slimy algae, stress or kill bugs and fish, and generally gross river users out. For nearly a century, stormwater was piped to the Boise River, and while new discharges are prohibited, the old plumbing is still in use and polluted stormwater from older roads and neighborhoods still rushes to the river when it rains. 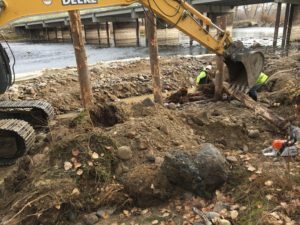 There will be less polluted stormwater flowing into the Boise River this winter thanks to the installation of green stormwater infrastructure (GSI) by the Ada County Highway District (ACHD) and its partners. Green infrastructure uses vegetation, soils, and other techniques that allow natural storage, use and infiltration of stormwater in urban areas. Practices include biorentention ponds and swales, permeable pavers and concrete, planter boxes, rain gardens and green roofs. Pedestrian improvement projects on State Street between Glenwood and Collister and between Willow Lane and Veterans Memorial Parkway include green stormwater infrastructure. Curbs, gutters, and sidewalks have been added, but instead of installing stormwater pipes to carry the water away, the runoff from State Street is directed via notches cut in the curb (curb cuts) to sandy areas where the stormwater soaks in. The sandy areas are two to three feet in depth and the sand removes sediment from the stormwater as it soaks into the ground. ACHD and Boise Parks and Recreation teamed up to install green stormwater infrastructure during construction of the Royal Blvd. extension on Capitol Street just south of the river. Stormwater flows off the new roadway and parts of 9th St. and Capitol Blvd. into drop inlets in the gutters where it’s piped into three bioretention planter basins. The basins are 6 1/2′ wide and 4’deep. The two on the south are 25’long and the one on the north is 150′ long. It’s a first-of-its-kind project that will use a custom Bioretention Soil Mix and plants specially selected by ACHD to survive periodic floods of polluted stormwater. Species include maiden grass, hyssop, cone flowers, black-eyed susan and perennial grasses. Stormwater bioretention planter on Royal Blvd. Stormwater management requirements for new development and major redevelopment in dense urban areas like downtown Boise can drive development to city edges and fuel sprawl. Thanks to a groundbreaking agreement between Boise and ACHD, developers will find it much easier to meet requirements and less polluted stormwater will discharge to the Boise River. The new coooperative stormwater paradigm is playing out on Broad St. between 2nd St and Capitol Blvd. 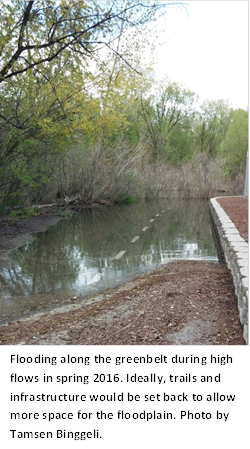 where ACHD, Boise and Capital City Development Corporation (CCDC) have reached agreement on installation and maintenance of stormwater facilities in the public right-of-way. To you it just looks like a mess, but the carefully engineered infrastructure being built below the street and sidewalks is a radical departure that will enhance the Boise River. Broad St. will be crowned to direct flow to permeable pavers in the parking lanes and to pocket bio-swales and infiltration planters. Stormwater from private property will discharge via roof drains to trees planted in special suspended pavement systems (Silva Cells) along the sidewalk. Capacity is being created to serve existing buildings without onsite retention and future development. This is known as “green turnkey” and will allow new developers to satisfy stormwater management regulations automatically. The delays and detours are a small price to pay for a cleaner Boise River. 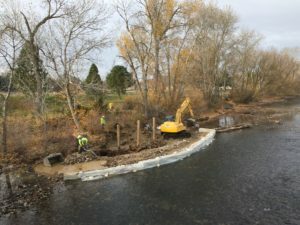 The Ada County Environmental Advisory Board’s project to improve fish habitat in a stretch of the Boise River near Barber Park and the Eckert Bridge gets underway this week. 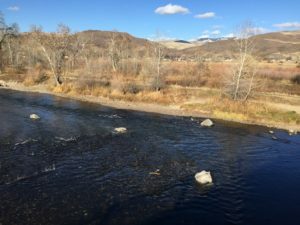 The $45,000 project will place engineered log structures and boulder clusters in the river that will improve fish habitat by increasing channel complexity as well as providing more cover and current breaks. The log structures will be partially buried in the riverbanks and anchored to the river bottom with log pilings. The riverbanks will be replanted with native willow species following construction using volunteer laborers. The project is expected to be complete by mid-December. During construction citizens will not have access to the river from the Barber Park Boat Ramp upstream to the Eckert Bridge and along banks and nearby trails while equipment is operating. The Idaho Department of Fish and Game generously provided permitting, engineering and project management services necessary to implement this project. According to the Idaho Department of Fish and Game, “this stretch of the Boise River is one of the finest urban trout rivers in the country. 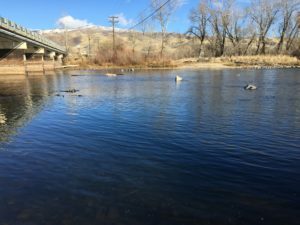 Wild trout and other fish species are abundant.” Enhancing fish habitat at this site was the first project the Ada County Environmental Advisory Board took on to enhance the Boise River. 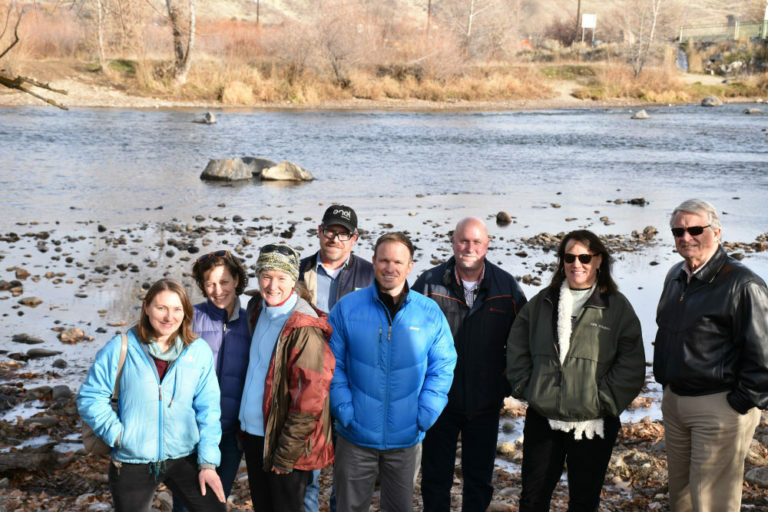 “The County is so pleased to see the hard work and dedication of this group come to fruition with a project that will not only benefit the fish habitat, but also those who enjoy the Boise River and what it offers our citizens,” said Ada County Commissioner Dave Case. The Ada County Environmental Advisory Board was formed in 2015 after a power outage at Barber Dam reduced river flows for a short time earlier this year. The Board is made up of staff from Ada County, the Boise River Enhancement Network, Idaho Department of Fish and Game, Trout Unlimited, The Freshwater Trust and Fulcrum/Enel Green Power North America (EGP-NA). The project was funded by Ada County and EGP-NA, who operates Barber Dam and is a co-licensee with Ada County on the FERC license to generate power at the dam. “As a company, we truly believe that community activities provide an excellent opportunity to engage and strengthen relationships among local stakeholders,” said Larry James, EGP-NA Regional Hydro Operations Manager. The City of Boise hired me on September 1, 2016 in a newly created Parks and Recreation position, Foothills Restoration Specialist. While a large portion of my position includes foothills rehabilitation and restoration, 25% of my time will be spent working on improving riparian habitat along the Boise River and associated waterways. The City of Boise developed of an updated version of The Boise River Resource and Management and Master Plan in 2013, and the plan was adopted by City Council in December 2014. This document addresses natural resource and identifies a need for an invasive species management plan along the river corridor. Many invasive species are problematic along the river, but some more so than others. 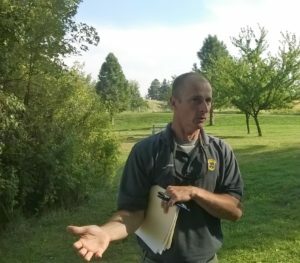 Boise Parks and Recreation is committed to implementing an active management strategy to reduce invasive species, but seeks feedback from experts and concerned citizens regarding prioritization of which species require removal and management first. We are also interested in collaborating with BREN and other special interest groups to determine priority areas for management and eradication trials. I hope to meet you at the Invasive Species Workshop co-sponsored by BREN and City of Boise on November 17 from 11:45 am to 1:00 pm at the Boise Depot. The Boise River Enhancement Network received a $100,000 Cooperative Watershed Management Program grant from the U.S. Bureau of Reclamation in 2013. With funding from the grant and thousands of dollars of in-kind matching support, BREN accomplished the following tasks. 1) Cooperatively developed a structure and operating process for BREN that defines participation, establishes roles and shares responsibilities and created an organizational sustainability plan. 2) Planed and conducted outreach that increased BREN’s effectiveness by building and diversifying participation. 3) Improved and expanded BREN’s communication services including publication of a monthly online newsletter. 4) Worked with stakeholders to assemble information about critical watershed issues, identify and prioritize enhancement needs and project concepts and use that information to create the Boise River Enhancement Plan published in October 2015. Reclamation has announced there will be Phase II funding available in 2017 to support the work of multi-stakeholder groups like BREN that have adopted watershed enhancement plans. The funds will support local watershed groups in implementing collaborative solutions to water management issues. Reclamation is currently accepting comments on the draft criteria and eligible project types for the Phase II funding. BREN will host meetings in the Treasure Valley to discuss ideas and identify partners interested in applying for funding for a project that implements recommendations of the Boise River Enhancement Plan. Reclamation will provide 50% of the funding and local partners will provide 50%. 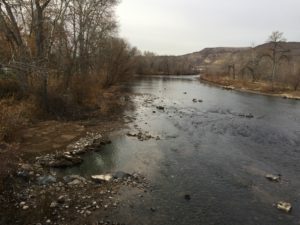 A new instream habitat project is set to be implemented this November in the mainstem Boise River – the first such project in decades and a top recommendation in the Boise River Enhancement Plan. 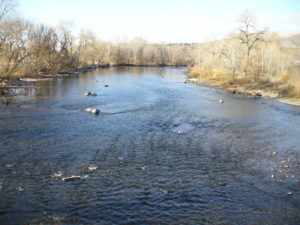 The Boise River lacks roughness elements, such as rock and large wood, that provide habitat diversity, cover, and velocity breaks for fish. And like many sections along the Boise River, the project location site (pictured above) is wide and shallow. It’s great for osprey and eagles for fishing, but not so great for fish looking for a place to hide! The new project involves the installation of engineered rock and wood features within the main channel immediately downstream of Eckert Bridge but upstream of Barber Park put-in for floaters. Because the project is being installed within the main channel, the design had to demonstrate that it would not increase flood risk, interfere with irrigation diversion or pose a safety threat to recreationists. In addition to large boulders, the design will include three sets of engineered log jams that will be submerged and anchored into the banks of the river. The logs will be placed so that they remain submerged year-round, providing critical habitat for fish during the winter when cover is scarce. Post project construction, several areas along the banks will need to be revegetated with native plants, shrubs and trees. This is the perfect opportunity for a volunteer riparian enhancement project – keep a look out for an upcoming announcement from BREN! BREN, in partnership with numerous stakeholder groups, advised on the type, design and location of the enhancement project. BREN hosted a site visit and project review for stakeholders in August 2016 and will organize the volunteer riparian enhancement opportunity. 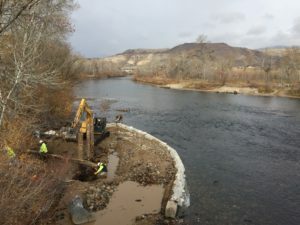 The instream habitat project is being funded by Ada County and Enel Green Power, and is being designed and implemented by the Idaho Department of Fish and Game.